Surveillance cameras are ubiquitous in public places. Crimes and/or the suspects participating in them are often captured on one or more of these cameras. Measuring the height of a suspect in a scene is usually a key piece of evidence in identifying the individual. PhotoModeler can be used to accurately measure the height of a suspect in a single image from an unknown camera. The example shown in this tip is a simulation of a crime scene where the suspect’s height needs to be measured. Since the source of the image is unknown, PhotoModeler needs to ‘solve’ the camera’s parameters (e.g. focal length), using some known information about the scene. In PhotoModeler, this is called the “Inverse Camera” feature. The investigator in this simulation first returned to the scene of the crime and surveyed a few points that had not changed since the day of the crime. He used PhotoModeler to do this using multiple photos from a calibrated camera, where he marked and referenced a few points in the office space to build up a model of the scene. Any survey tool can be used to generate these points. 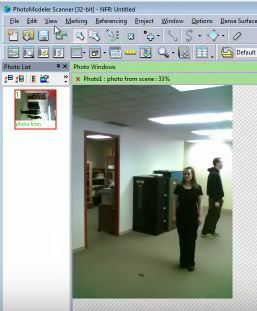 The surveyed points become the “control points’ imported into the single-photo PhotoModeler project showing the suspects. The “Manual Modeling” project was started (See “Getting Started” panel in PhotoModeler), the single photo loaded into the project, and the ‘Unknown camera solved by Control Points’ option for the camera was selected. The control points created previously by the investigator were imported into the project, and marked on the photo in the appropriate locations (on features that hadn’t changed) using “Control Point Marking Mode” from the “External Geometry Explorer”. A surface was modeled on the floor of the scene and “Surface Draw” points were used to mark the location where the suspect’s feet met the floor, and the location of other relevant items. Next, “Z axis Offset Points” were added to the surface draw points (offsets are created in the “Properties” of the selected surface draw points) at the base of the female’s feet. The offset distance property is adjusted until the displayed projected offset point meets the top of the head. Using this technique, her measured height was 63.5 inches (her known height was 63 inches). The steps are repeated for the male in the image (who appears to be slouching somewhat), and the measurement came out to 71 inches (his known height was 72 inches). This tip is closely based on this Knowledge Base article which outlines this and two other approaches to measuring suspects’ heights. These approaches can be used to measure the dimensions of any object in a photo – it does not only apply to criminals! PhotoModeler has been successfully used in a wide variety of investigations and court cases, where the obtained measurement data was a critical component.